As a believer, I've always clung to the verse Jeremiah 29:11. It's an easy verse to gloss over, step back and say "well that there's really swell. God's planning something special for me that going to give me a great future." Then we step back into life, and when reality hits, we easily forget those verses and that plan. In a society that revolves around social media, it's easy to get caught up in the planning; planning for the weekend, planning for the vacation, heck... they even have planning for groceries, coupons, you name there's a plan. But in reality those plans are all futile because they are OUR plans. It's good to be prepared, but it's another thing altogether to want to be so in control of things that when our plans have to change that we are unable to let go of what we had wanted. And that's when we realize it. We realize that we're not God. He is. He's in control of EVERYTHING. Even when it feels like everything is out of control, it really is in control. His control. Lately, God's been teaching me this whole control thing. As if I've not gotten the message clearly enough before now, He's strategically placed me in a place where I can only tell Him that He must know what He's doing, because I feel completely ill equipped for what He's about to place me in. Most of you know that I have struggled lately with Brayden. He is a joy and a light in my life, but he is also a huge challenge. At only 1, he knows what he wants and everyone knows when he doesn't get it. He is stubborn-headed, strong willed and has a temper like a bull. I've always said that I wanted my children close in age, around 2 years apart, but as I have dealt more with Brayden I have questioned my sanity in that statement. I just don't know how I would handle a newborn along with my strong-willed, type A son. Drew and I had started talking about when we might want a second child, and had decided we'd probably wait until the end of the summer to try, but even then we were both hesitant with that and knew that we might get to the end of the summer and change our minds yet again. But clearly God had different plans. And definitely a sense of humor. On March 29th I was 4 days late. Late as in GIRL late. I kept thinking of different reasons why this might be, but on the 29th, I decided to do it. I pulled out the Clear Blue Digital and Peed On A Stick. Most of the test instructions say that a pregnancy test will take 3-5 minutes for an answer to pop up. Mine took less than a minute. PREGNANT. I sat there in disbelief. Brayden, in typical fashion, was screaming on the floor because I wasn't paying attention to him. So as not to make him feel left out, I decided to start bawling with him. And I'm pretty sure that I bawled the rest of the morning. I pulled my boot straps up and got us together enough to meet Drew for lunch that day. When I told him, I cried. And honestly, this sounds terrible, but it wasn't out of excitement. I have to admit that I was in sheer panic mode at that point. Drew, on the contrary to what I had imagined him doing, was ecstatic. He even started making mention of baby #3. Hold your horses there cowboy, I can't even comprehend the fact that I am with child and I have a babe in front of me who needs me 24/7 as it is. I remained in shock for probably about 3 weeks. I still go through times where I question God, but don't we all? Some might say that I shouldn't say that I was mad, or angry, or upset about being pregnant, that God is the giver of life and that all children are a blessing from Him. And I totally agree with them. On the latter part anyway. I think it's perfectly normal to question God. It's what you do with that questioning that is the key issue. I've brought my questions to God and you know what? I still don't have a clear answer. But I do know this: He is bigger than 2 children. He is bigger than my naptime stresses, poopy diaper messes and wondering about when I'll ever shower again. HE. IS. BIGGER. And clearly He thinks that I am ready for another one. Or at least that He'll use another one to mold some of those rough edges that are on me. So I'll embrace this new plan holding on to the fact that He is bigger. And if you've made it through this entire post, I applaud you. I felt like I just verbally threw up in front of the world. But this is my blog and I intend to honestly write about what is going on in my life, so you get to deal with it. 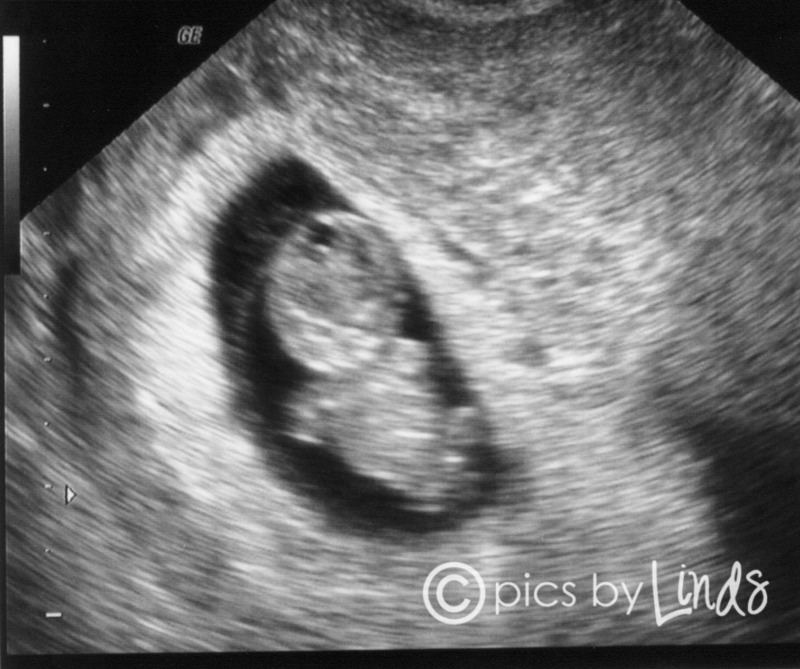 And as a special bonus, I'll give you a preview of baby #2, who looked fabulous today in his/her first ultrasound, had a heartrate of about 170bpm, and clearly was enjoying the leftovers of my coke I had at lunch, because that baby would not sit still (like it's big brother!). And yes, I am getting excited. One day at a time I get more and more used to the idea of #2 toddling around with Brayden. Thank goodness God gives us 9 months to prepare.